We don’t take it lightly when we call this the best chili recipe. We have made this chili recipe with our family for years. It’s the perfect hearty and full flavored classic chili recipe everyone loves. Why is this the best chili recipe? I can’t tell you just yet, you have to keep reading and then be prepared to take this to your next chili cookoff – AND WIN! Or, if you don’t have time to read, hit that JUMP TO RECIPE button up top and print it out. If you don’t have a few hours to dedicate to this chili recipe, you can also find the same recipe converted to a slow cooker chili. One of my favorite things about this recipe is that you can probably take it to any chili cookoff and win, or at least place in the top 3. I’m completely serious when I say this! It’s full of delicious mouthwatering flavor and it is something my family and I have made for years. I have several bags of this prepped and ready in my freezer for those days when I am craving this delicious recipe but don’t have the time it takes to make it. What Ingredients Go in Homemade Chili? This is such a delicious recipe made with onion, peppers, oregano, beans, and tomato flavoring. It takes some time to make it, but it is worth every single second. Here are the ingredients I use for my homemade chili recipe. Note: this recipe does call for tomato paste, which some people have a strong aversion to. If that’s you, you can substitute the tomato paste for a larger size of tomato sauce. We’ve done that for you in the recipe below. What Spices go into Homemade Chili? Many people ask “why sugar?” Believe it or not, adding a little bit of sweetness to this recipe changes the flavors to perfection. I am going to share a secret with you. 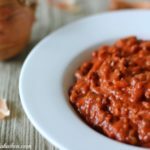 Remember I mentioned at the beginning of this post I would share what makes this the best chili recipe? Well, here it is. Before we do ANYTHING else, we take the lean ground beef, make it into large hamburger shaped patties. We place those on a heated outdoor grill with mesquite wood chips and cook them thoroughly. The smokey mesquite flavor is what REALLY takes this chili to the next level. Of course, you don’t have to do this extra step, but if you are looking to knock the socks off of anyone eating this chili, don’t skip this step. If you haven’t grilled the ground beef as we mentioned above, use your favorite skillet to get things started. How do I store homemade chili? After serving, you can store any leftovers in an airtight container in the refrigerator for up to 3 days. After that, I would consider freezing any leftovers for use on a later date. How do I freeze homemade chili? When you are ready to freeze, I recommend using a freezer system such as this one. They are able to correctly seal your food without leaving any air pockets, which can hasten freezer burn and ruin your frozen foods. What did you think about this recipe? Are you ready to try the best chili recipe ever? I can’t wait to hear all about it! Make sure you leave a comment or tag me with a photo if you are on Instagram (#pinkwhenjen and @pinkwhenjen). This is the best mouthwatering, homemade chili recipe, and we've made it for years! The secret to making this the BEST is by grilling the meat with mesquite wood chips before adding it to the recipe. Don't skip this step if at all possible! Consider doubling or tripling the batch and freeze some for later. Substitute the tomato paste with a 15oz. can of tomato sauce if needed. It’s so good, and we are also picky when it comes to our chili. It’s delicious! I’m picky about my chili too. This looks great and your photos are awesome. Are you loving the 50mm? I am totally loving my 50mm. I had a 50mm 1.8 but I always shot on AUTO (shudder, i know.) Now that I have the 50mm 1.4 and am teaching myself how to shoot on manual I am LOVING it. I think the pictures are looking MUCH better. Oooohhhh… that looks so good! I love chili. It really does warm you up from the inside. Sounds so good! 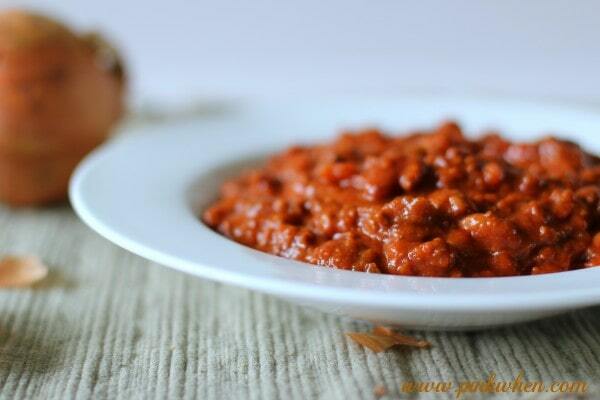 I love chili too…now I want to make this this week! That looks incredible! I love chili. Hi. I’m making your chili right now and just noticed it calls for 1/2 a CUP of Chili powder. Is that correct??? That’s a ton! Thankfully I scrolled thru your entire post and you have your recipe written out twice. I saw the other one said 1/2 Tbs, which is what I figured it had to be, but I really appreciate you responding so quickly! I have it simmering now and I’m sure it will be wonderful!! Thank you!! Looks awesome, going to get ingredients now! What size cans of tomato paste are we talking? Hi Amber, they are the small cans, I believe it’s 6oz? The smallest one’s you can get! Jennifer, do I drain the canned beans or just put them in even with their juices? I’m kind of new to making chili. I have this cooking on the stove now and it looks and smells delicious! I couldn’t find any canned tomato juice when I was picking up the ingredients so I had to use V8 juice instead. I can’t wait for it to be ready! I just made this and it is amaaazing! Thanks for sharing! Oh no Angie! I did not realize that the card at the bottom was still wrong. 🙁 I have changed it and both the instructions at the top of the post and the bottom card you print out are now changed. Hi There! Your chili looks delicious! What color of bell pepper do you suggest? Thank you! I noticed there is no salt in the recipe. Can that be right? I followed the recipe exactly as printed and I found it to be very bland. It tasted like tomato paste with beans and meat. I had to spice it up with with more spices and added tomatoes to it. I read the reviews thoroughly before trying. I was really disappointed in the outcome. Wow Patrice! Thanks for the feedback. Hopefully you didn’t miss something when you made it, because you are the first to dislike it. I would suggest doubling up on the cayenne in order to spice things up a bit. If that’s not good enough, add a little Louisiana Hot Sauce, that always makes things better 🙂 I wouldn’t recommend that to the average chili eater….otherwise they probably won’t be able to tolerate the heat. Hi, my husband is not a fan of tomato paste. Is there anything I can use in place of it? I made this recipe tonight. It was awesome. I used ground turkey and V-8 juice instead of regular tomato juice. My husband had two bowls tonight and asked if we had enough for a couple more days. Best we have had in a long time. Thanks for a great recipe. I didn’t realize I needed to get the small cans of tomato paste…so i used the regular size. Ugh. Is it totally ruined? I don’t think it will be ruined AT ALL. It will just be a little thicker. I bet you will have a winner on your hands with this one 🙂 Let me know what he thinks! Sounds delicious but instead of x cayene pepper I would use x chili powder by about 2 Tlbs. If you don’t like tomato paste, use some tomato sauce. I always use petite diced tomatoes (unblended). And V8 is a wonderful sub. Hi Brittney! Yes, I do actually use a lot of tomato juice in this recipe. If you purchased 4 cans, you should be close enough! Will the recipe be good if I don’t use beans? Or will I need to change it at all? I can’t stand the texture of beans. I’m excited to try this recipe, it looks delicious and the reviews are great, I will definitely write one of my own once I try it. I’m wondering if you have a suggestion to finishing it in the CrockPot instead of simmering on the stove for the 2 hours though, it’d be much appreciated! Hi I made this for Sunday dinner and it was great! I made as directed and used the v8 instead of tomato juice. My husband said it was the best chili I’ve ever made! I will be making again! Thanks for sharing this delicious chili recipe. I got lunch for two days too! I am interested in this recipe. Do you not sauté the onion and pepper before adding it to the mix? I have not done that, but I am not sure I would use dry beans because I would worry they would not cook all of the way through. Can I add cooked bacon to this? You think i should at it so it simmers for the 2 hours or at the end? You can probably add bacon, I would just cook it first. This recipe looks great. I’m just about to cook the meat, but I had some questions that were answered through the other comments, like whether to saute the onions and bell pepper first (no) and whether to toss the liquid from the beans (probably). I wish I had a sense of how spicy this will be. I don’t toss the liquid, I add it in. You can saute the onion and bell pepper first if you want to. I have done it both ways and can’t usually tell a difference. Hope that helps! I’d like to make this in the crock pot,like you answered in another response having the meat browned first. how long does it need to cook once put into the crock pot on high for the same amount of time or longer? If you are going to brown the meat prior to placing it in the crock pot I would probably say 4 hours on high would be adequate enough in my opinion. Hope that helps! I just made this recipe. It is so easy to follow and chili tastes great!!!! Thank you for sharing. 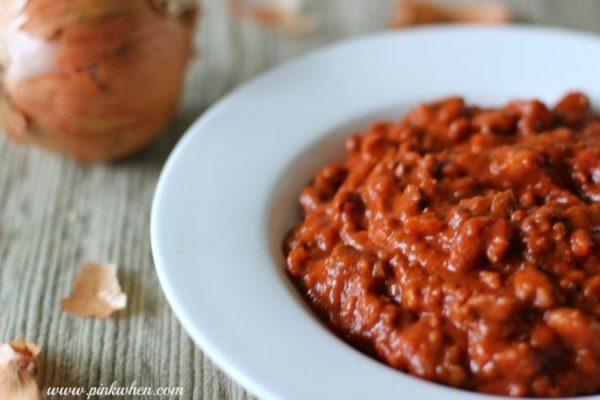 Can I use Bush baked beans instead of Pinto & Kidney beans? You could, but I am not sure how that would turn out. I’m giving this recipe 3 stard bc it was a good base for chili. I didn’t realize there was no salt in the recipe and I tasted it. I tweaked it a little by adding salt and pepper and a little extra chili power, onion powder, and garlic powder. After a few taste tests it turned out great. I’d make it again but with my additions. Thanks for this! I also added salt. It really brings out the flavor of things. What color onion do you use? I am a huge fan of red onions, but I have used white and still loved it. This is the first time I’ve made chili with spices… I’ve always used the crappy sodium-filled spice packets, but have vowed to turn a new leaf! There’s about 20 minutes left of simmering, and I’ve had a few nibbles here and there to make sure it’s spiced just right. I added a pinch of salt, some celery and mushrooms (gotta have mushrooms!!!). My fiance just walked through the door and said that it smells awesome! Tastes great so far too! Thanks for the recipe! I made this for the first time a couple weeks ago and my husband said it was the best chili I’ve ever made…(that is saying a lot bc Ive made many chili recipes). The only downfall I had about the recipe is that it seemed a tad liquidy. I drained all the juice from the beans. any suggestions? Did you simmer for 2 hours without a lid? I find that helps. Also, if you cut down the simmer time, it will have more liquid in it. You would need to make sure you simmer for 2 hours to reduce all of it. If you did simmer for 2 hours and there was still a lot of liquid, I would simmer for a little longer until it is the consistency you prefer. Hope that helps! I just made this today and it smells amazing. I paired it with some buttermilk cornbread and cinnamon/honey/powdered sugar butter mixture for the cornbread. I didn’t add all of the tomato juice though it seemed too much. I added about half and also added a can of diced tomatoes. The spices melding together just seem so beautiful and it sure was fun to cook! And for a beginner like me teaching herself, it was easy and fun. I’m so glad you like it! It does make a lot, but we love to freeze extra portions when we make it. I followed this recipe to a T. It seemed like it was all hamburger, and didnt look anything like the picture. That’s unfortunate Ashley. Hopefully you get better results if you try it again. You did use tomato juice versus tomato sauce, correct? That to me would be the only explanation as to why your chili thickened up, unless you cooked it on a higher heat level, which would have made it dry out faster. I’m planning on making this recipe tomorrow and it’s the first time I’m going to make chilli. Can I know approx how long does it take to brown/cook the lean beef? You can probably count on cooking/browning of the beef for about 10 minutes. The entire recipe from start to finish is right at 2 hours, so make sure you set aside enough time. Omg!!! This is truly the best chilli ever and it’s so healthy. Love it. Could you also make this in a crockpot? This looks really good. It actually looks like a chili my dear departed dad used to make, which also had tomato juice as an ingredient. It’s on the cooktop now, simmering away for supper tonight. One addition though; chili without garlic is like a PBJ sando without PB. Must have. Thanks for the rec. We loved it. Very tasty indeed. I received this compliment after sending a batch to work with my husband. Thank you so much for sharing the BEST chili recipe ever! This has been my go to recipe for chili for about a year now so I thought I should post a review. I’m very picky about my chili and this has been by far the best recipe I have ever tried. Thank you for sharing . :)…..btw…I want to rate it 5 stars but the star will not register. I’ve made this recipe numerous times & everyone always loves it!